This chart shows grade STAAR reading mastery rates for Central Texas third graders over the last 7 years. There was a three-year increasing trend in mastery rates from 2014 – 2017. Unfortunately, that trend is not reflected in 2018 mastery rates, which dropped significantly for all ethnic groups. 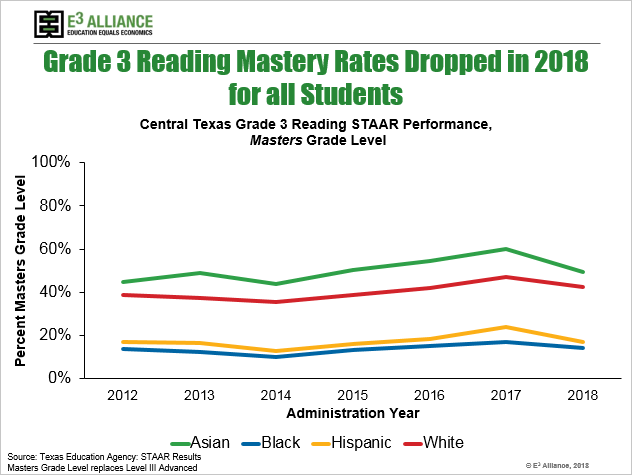 Mastery rates for Asian students dropped approximately 10 percentage points, rates for Hispanic students dropped approximately 7 percentage points, and rates for White and Black students dropped approximately 5 and 3 percentage points respectively. These reductions are particularly concerning for Black and Hispanic students, whose rates had reached a high in 2017, but were still below 25%. In comparison, reading mastery rates for students in 5th and 8th grade remained flat. Further, while a similar drop is seen in 2018 3rd grade math mastery rates, math mastery rates for 5th and 8th grade actually increased. 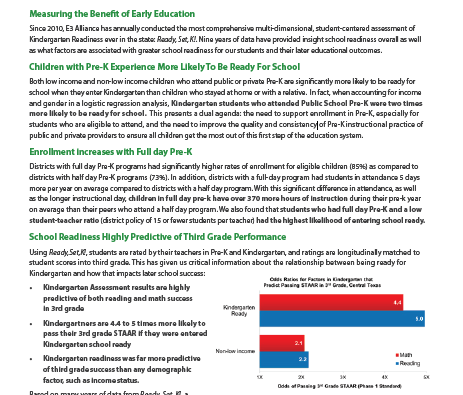 See more STAAR outcomes at https://data.e3alliance.org/staar/.